On Monday, April 30th over fifty people gathered to celebrate the opening of a new post-secondary occupational school in downtown Stamford. The Northeast Medical Institute is located at 29 Bank Street in the heart of Columbus Park with easy parking all around. Community leaders from the City of Stamford, Building One Community, the Family Centers, the Stamford YMCA, Stamford Hospital, DOMUS, Stamford Academy and the J.M. Wright Tech School gathered to learn more about the certification programs being offered that are geared to help jump start healthcare careers for individuals in transition and those seeking new career opportunities. The school can serve up to 60 students per month during the day and evening courses. They expect to graduate 200 students per year as certified nurse’s aides and phlebotomists. 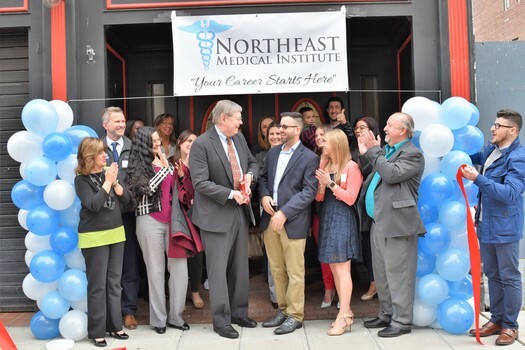 Former Stamford Health Medical Group member, Daniel Remiszewski, owner of the new school, was inspired to open the best hands-on training facility while working with a cerebral palsy patient and realizing the dire need for healthcare professionals in the lower Fairfield community. Remiszewski, received accreditation from the Department of Public Health and the Connecticut Office of Higher Education to lead this new school. Offerings: Northeast Medical Institute will offer certification training for Nurse Aides, Phlebotomists and offer American Heart Association CPR courses.